Every now and again a story comes alive that breathes new life into the EDM community and helps reaffirm what the community is all about. 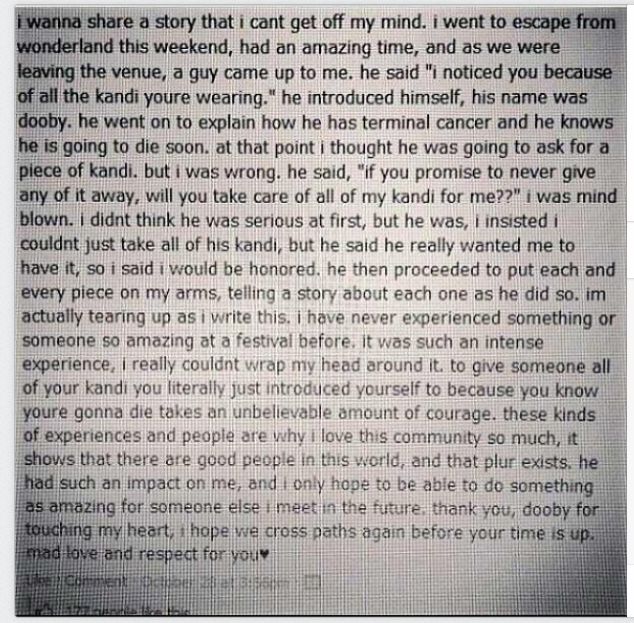 Earlier this morning we came across the following story below, about a young man who has terminal cancer and without question decided to spend his “last rave” at Insomniac’s Escape From Wonderland in Southern California. The anecdote describes how Dooby approached someone and said to her “if you promise to never give any of it away, will you take all of my kandi for me?” he told the story about each piece and left her with all of his kandi. We can’t help but think about this story and how much courage it took for him to 1) share his story and 2) give all of his kandi away. If you’re not familiar with the rave culture, kandi symbolizes memories and stories and so much more to the person giving and receiving it. So while we are still taking in this story and really letting it digest, we wanted to take a minute to encourage you to keep people like Dooby in your hearts and spirit, and to remember that genuine people really do exist. A little bit of faith in humanity can go a long way, and Dooby is shining example of this. It’s also important to really think about what the EDM community stands for, especially when the media at times might have the exact opposite to say. Peace, love, unity and respect. These guiding values stemming from within the community can not only change your life, but can change others as well. Whether you’re a raver or not, we’re all human. And while we as humans don’t live forever, our thoughts and memories always will. Lots of love and positive vibes sent your way man. You will forever be an amazing representation of what this community (and world) should be about: the compassionate love for life and for those around us.